March 21, 7:45 a.m. Monday of Holy Week. Low Mass in the Extraordinary Form. March 23, 7:45 a.m. Wednesday of Holy Week. Low Mass according to the Ordinary Form. March 24, 4 p.m. Holy Thursday: Mass in Cena Domini. Dominican Rite Missa Cantata, with transfer of the Blessed Sacrament and Washing of the Altar. March 25, 3 p.m. Good Friday: Solemn Liturgy of the Lord's Passion according to the Dominican Rite, with singing of the Passion, Veneration of the Cross, and Holy Communion. 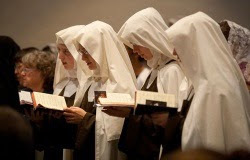 March 26, 11 p.m. Easter Vigil: Mass in the Ordinary Form, in English with Gregorian chant Propers and Ordinary sung by the nuns. The father of one of the nuns will be baptized and confirmed at this Mass. March 27, Easter Day. T.B.A. The Carmel is located at 68 Rincon Road, Kensington CA 94707. There is ample parking. The picture of the nuns on this post was taken during their visit at St. Mary's Church in Moraga CA before moving to their new monastery and the establishment of enclosure.